ROTAIR-Software provides you with the FlightLog a pilot logbook tool around the management of planned and completed flights. That means the pilot logbook software FlightLog supports the user in the billing, pilot logbook administration, helping to create routes and has multiple evaluations, which supports pilots in their daily work. 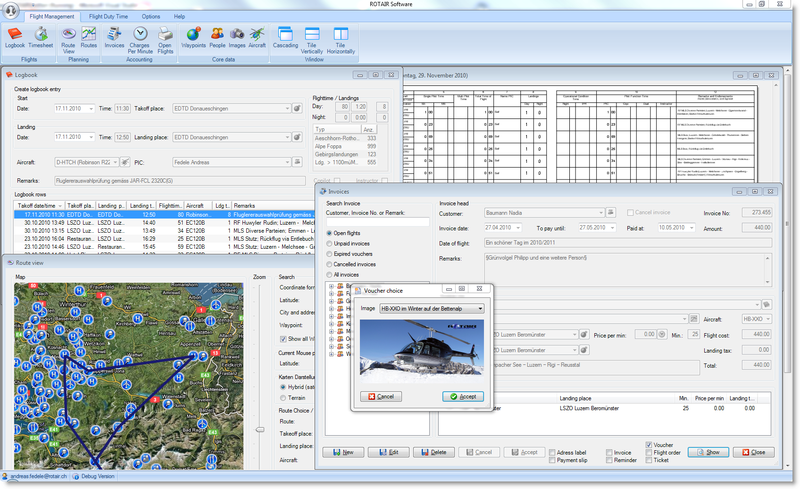 The mobile version of the flightlogger software offers you almost the same functionality as the Windows version does. Most important the pilot logbook functionality is full implemented in the app. If you have an iPhone / iPad/ iPod please have a closer look at the short tutorial for these devices or watch the video with the first steps. Download the Windows version of the pilot logbook now! With the electronic pilot logbook, you are always up to date. You can find all your registered flights and obtain information about the flight times in the last 6, 12 and 24 months. The electronic flight book lends itself to personal, professional and commercial pilots. The flight log program also includes a billing functionality, allowing you to directly create for your flights using the scheduled flights bills. Currently, we are developing a web interface for our pilot logbook software. Since the data are centrally stored on the ROTAIR server, you can then from any PC with Internet access to your flight log and track your flights so directly at the airport. Currently, there is a first version of the web application available, which is still in alpha stadium. With this online flight logbook you have all you data available you just need access to the web. In all of the above mentioned versions you have many reporting possibilities. There is a report similar to the paper version of jeppesen logbook and for european pilots a JAA version as well. Have a look at our applications and see yourself all the provided reports. Die App bietet einen großen Umfang an Funktionen, die mir in der Erfassung von Flugzeiten hilfreich sind. Ich selber bin Inhaber einr PPL und habe meine Flüge / Flugzeiten somit sets im Blick. Ich kann außerdem ersehen, wieviel Zeiten ich auf bestimmten Flugzeugmustern habe. Rundum ein tolle App. Merci beaucoup! Continuez à dévelloper cette excellente application! Pourriez-vous ajouter l'option d'enregistrer les temps de vol en centiémes d'heure? Merci!